You are here: Home / Owner’s Manual / PEO & Co-Employment / What Is Workers’ Compensation and How Does It Work? Everyday we are at risk of stepping in something unexpected and unpleasant. To put our minds at ease we do things like purchase auto, health, and homeowners insurance; but what about workplace hazards? Sure, a fine-tuned safety program helps prevent accidents but what do you do when an accident occurs anyway? What happens when one of the workers in your business is hurt on the job and you’re the one expected to make sure this employee is taken care of financially until they can safely return to work? That’s where Workers’ Compensation Insurance (WCI) comes into play. What is Workers’ Compensation (WCI)? The modern workers’ comp system is a complex one. So complex that it often creates headaches for business owners, safety, and risk professionals who must deal with it on a regular basis. Some employers have a hard time understanding what it even is, and whether they need it or not. This article was created to help you understand why you may need WCI and what it’ll do for you when, not if, an incident occurs. 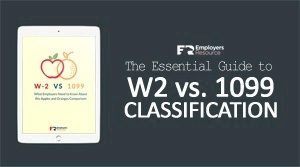 All employees should be covered under your WCI, but that doesn’t include independent contractors or unpaid volunteers. However, if an independent contractor doesn’t have their own insurance and they work on the employers job site they may require coverage by you, the employer. State-by-state laws can vary greatly. To learn about a state’s specific requirements contact us at (800)574-4668 or see what we can offer your business here. At Employer’s Resource, we help business owners understand WCI as well as provide you the best plans out there. Our goal is to prevent and eliminate workplace hazards before they cause an injury, but we’ll be there for you when an accident does occur to ensure that your business and employees are covered. What are your questions about workers’ compensation insurance? Let us know in the comments if there is something else you’d like to know! https://www.employersresource.com/wp-content/uploads/2015/03/Not-IF-but-WHEN-workplace-injury-occurs-will-you-be-ready.png 1024 682 Employers Resource https://www.employersresource.com/wp-content/uploads/2016/07/employers-resource-national-PEO-strength-local-service.png Employers Resource2015-03-13 10:00:002016-08-05 08:06:37What Is Workers' Compensation and How Does It Work?